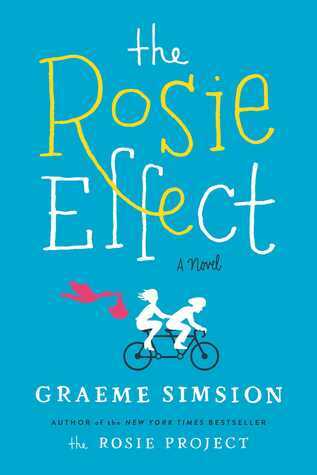 I adored The Rosie Project and finding out there was another book coming out with more of Don and Rosie made me extremely happy. I thought this book was wonderful not as great as The Rosie Project but great none the less. I think the whole fun of The Rosie Project ( at least for me) was getting to know Don and maybe since we have already been introduced to him I feel that this wasn’t as great. Now do not get me wrong like I said I thought this book was wonderful. We got Don and Rosie and their entertaining if not complicated relationship in which becomes more complicated with a baby on the way. I found the logical way Don thought of everything at times rather humorous and at times kind of heartbreaking. I mean the poor guy couldn’t just enjoy the idea of becoming a father he had to break it all down. I have to say though I adore Don he has to be one of the sweetest and thoughtful although not your “average” character. He gets himself into some problems that turn out to be rather hilarious and made me a few times laugh out loud. Rosie…. I just felt sorry for her from the beginning. Its not that I didn’t like her I just think her situation and how she was dealing with it and how Don logically responded was sad. I mean most of the time I thought Don was doing amazingly and was in his own way receptive to her needs but I could see where she would draw her conclusions in which seemed to cause their relationship to head for a downward spiral. Anyway! Humorous, Slightly more serious than the Rosie Project, at times Hearbreaking, Hopeful and Heartwarming. I just adore these characters.